Ballard was summarily disbarred after the Office of Chief Trial Counsel of the State Bar transmitted evidence of finality of his convictions of one count of grand theft (Cal. Penal Code Section 487(a)) and 17 counts of money laundering (Cal. Penal Code Section 186.10(a)). The offenses are felonies involving moral turpitude. Butler was disbarred by default. Though he participated in the initial status conference in his disciplinary matter, he failed to file a response to the Notice of Disciplinary Charges against him, nor did he respond to the eventual petition for disbarment or move to set aside or vacate the default order. He was found culpable of 12 counts of professional misconduct related to three separate client matters. The wrongdoing included: failing to render an appropriate accounting of client funds, two counts of failing to respond to reasonable client inquiries about case status, and three counts each of failing to perform legal services with competence, improperly withdrawing from employment, and failing to release clients’ files after being requested to do so. Cohen was disbarred by default after failing to appear at his original disciplinary proceeding. He had earlier signed a joint pretrial statement, and did not move to have the default entered against him set aside or vacated. Coppock was disbarred after he stipulated to depositing and commingling personal funds in a trust account. In total, he made 32 impermissible electronic payments and issued 17 checks from the account, as well as depositing $161.50 of his personal funds into it. In aggravation, Coppock committed multiple acts of wrongdoing and had three prior records of discipline. In mitigation, he entered into a pretrial stipulation, caused no harm to any clients, and suffered from diagnosed psychological difficulties — now treated — as well as from emotional difficulties following his wife’s death. Cvetich was disbarred after he stipulated to committing 10 acts of professional misconduct involving three client cases as well as several violations of disciplinary conditions imposed earlier . In the client matters, his wrongdoing included: collecting an illegal fee and failing to keep a client informed of significant case developments; two counts of failing to respond to reasonable client case status inquiries, and three counts of failing to perform legal services competently. He was also culpable of failing to comply with numerous reporting conditions contained in a probation order imposed earlier and of failing to comply with notification requirements mandated for suspended attorneys (Cal. Rules of Ct., Rule 9.20), then falsely declaring that he had complied — misconduct involving moral turpitude. The client case fact patterns were substantially similar: Cvetich was hired to represent clients in various types of legal actions, then failed to take necessary actions to pursue their claims. In one workers compensation case, he also accepted a fee before the amount was approved or set by the Workers Compensation Appeals Board as mandated. In aggravation, Cvetich committed multiple acts of misconduct, significantly harmed his clients by his failure to perform, and had a prior record of discipline. Datta was disbarred by default after he failed to appear at the trial of his disciplinary case. Through counsel, he had earlier filed a notice of intent to default, acknowledging it would serve as an admission of his culpability. His wrongdoing included six counts of professional misconduct related to his client trust account: failing to maintain client funds in trust and failing to maintain a sufficient balance in the account, as well as four counts of intentionally misappropriating more than $148,776 in client funds — misconduct involving moral turpitude. Kang was summarily disbarred following transmission of evidence of finality of his convictions of one count of tax evasion (26 U.S.C. Section 7201) and two counts of wire fraud (18 U.S.C. Section 1343). The offenses are both felonies, and the wire fraud violation involved moral turpitude as a matter of law. Kilstofte was disbarred by default after he failed to participate, either in person or through counsel, in the disciplinary proceeding in which he was charged with seven counts of professional misconduct related to two separate client matters. The State Bar Court judge determined that he had received adequate legal notice of the proceedings. He was found culpable of six of the seven counts charged, including: improperly withdrawing from representation, failing to respond to a client’s reasonable inquiries, failing to inform a client of significant case developments, and failing to promptly return a client’s file upon terminating employment, as well as two counts of failing to cooperate in the State Bar’s investigations of the wrongdoing alleged. Kilstofte had been disciplined by the State Bar for professional misconduct twice previously. LeBouef was disbarred by default after he failed to appear at his disciplinary proceeding. He had earlier appeared with counsel at a status conference, and then filed a Substitution of Attorney to represent himself in pro per. But did not appear for the trial, and a default order was entered. He did not move to have it set aside or vacated. He was found culpable of eight of the 10 counts with which he was charged. The wrongdoing, which related to a single client matter, included one count of collecting fees prohibited by the Probate Code and four counts of failing to comply with all applicable laws. An additional three counts involved moral turpitude: exercising undue influence on a client, breaching fiduciary duties by placing his interests above those of other trust beneficiaries, and suppressing testamentary evidence by removing his client’s will in an effort to hinder probate. Mix was summarily disbarred following his conviction of filing a false income tax return (26 U.S.C. Section 7206(1)) — a felony involving moral turpitude as a matter of law. Taylor was disbarred by default. He had attended an earlier voluntary settlement conference in the matter, but did not appear for the trial or file a response to the motion for entry of the default against him. He was found culpable of nine counts of professional misconduct related to one client matter and three banks at which he maintained client trust accounts. Specifically, his wrongdoing included: failing to perform legal services with competence, two counts of failing to maintain client funds in trust, and six counts involving moral turpitude in which he wrote checks on accounts with insufficient funds and from nonexistent accounts. Taylor had one prior record of discipline, and when the disbarment order was issued, there were four other State Bar investigations pending against him. Younger was disbarred by default after she failed to file a response to the Notice of Disciplinary Charges with which she had been served. The State Bar Court judge determined that the service was legally adequate, and that Younger did not seek to have the default order entered against her set aside or vacated. She was found culpable of violating several conditions of a disciplinary probation order entered earlier — including failing to timely submit quarterly and final written reports and client funds reports and failing to submit proof of attending the State Bar’s Ethics and Client Trust Accounting Schools as well as proof of passing the tests for those sessions. Younger had a prior record of discipline, and when the disbarment recommendation was made, there were other investigations and disciplinary charges pending against her. Adams was suspended from practicing law for 90 days and placed on probation for two years after she stipulated to committing six acts of professional misconduct as determined in another jurisdiction. She was suspended from practicing law there for one year. The California State Bar Court determined that the proceeding in the other jurisdiction provided fundamental constitutional protection and concluded that Adam’s culpability of professional misconduct also warranted discipline in California. In the underlying matter, Adams represented a client, a Hawaii resident, in a tax matter. The client was expecting to receive a large inheritance, which Adams agreed to put in her client trust account while he dealt with the IRS and to make payments out of the account to third parties on his behalf. The client subsequently gave Adams checks totaling more than $113,608, which she deposited in her client trust account and made payments at his direction to cover his personal living expenses. During the time she held the client’s funds, the account balance dipped to impermissible levels several times; she also made numerous deposits of personal funds and withdrawals for personal expenses from the account. In addition, she failed to file state and federal tax returns during that time. In aggravation, Adams committed multiple acts of wrongdoing. In mitigation, she had practiced law in both California and Hawaii discipline-free for more than 15 years and had demonstrated in the Hawaii proceedings that she possessed good character and had participated in a significant amount of pro bono work. Ahlers was suspended for two years and placed on probation for three years after he stipulated to failing to comply with several of the terms imposed in an earlier disciplinary order. Specifically, he failed to timely submit a written quarterly report to the Office of Probation, failed to report compliance with his treatment conditions in that report, and failed to report compliance with his underlying criminal probation. He had been convicted of using an electronic communication device with the intent to annoy (Cal. Penal Code Section 653(m)(b)). In aggravation, Ahlers committed multiple acts of wrongdoing and had a prior record of discipline. 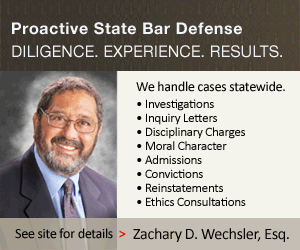 In mitigation, he entered into a prefiling stipulation, saving the State Bar resources and time. Aka was suspended from the practice of law for six months and placed on probation for three years following a State Bar Court hearing considering his professional misconduct in the U.S. Tax Court, which resulted in two different discipline orders as well as eventual disbarment from that tribunal. One tax court matter resulted in a public reproval. In it, Aka was identified as the attorney on a redetermination, but failed to show at the trial of the case held one year later and failed to respond to the commissioner’s attorney’s calls and letter about the matter. At various times and in various venues, Aka maintained he “did not consider himself to have been retained” because the client had not paid the agreed retained fee. Both the tax court and State Bar Court agreed that Aka’s conduct constituted professional misconduct: failing to respect the court, failing to respond to a client’s case status requests, and failing to deliver legal services competently. Aka had defended that his behavior was “aberrational” and that the clients in all seven cases had been “very difficult and very uncooperative.” The tax court, however, ordered him disbarred and unable to practice before it. An appellate court affirmed the disbarment decision, finding the due process claims Aka raised were “completely devoid of merit.” The State Bar Court found Aka’s actions constituted professional misconduct in failing to provide legal services with competence, failing to respect the court, and failing to follow a court order. In aggravation, Aka committed multiple acts of misconduct, significantly harmed the administration of justice, and had two prior records of discipline in the U.S. Tax Court. In mitigation, he presented evidence of his good character from more than 25 witnesses as well as significant evidence of performing community service, and has taken significant steps to prevent future misconduct — including voluntarily completing nearly 250 hours of continuing legal education. Anyanwu was suspended from practicing law for 30 days and placed on probation for two years after he stipulated to committing three acts of professional misconduct in a single client matter. He was found culpable of prospectively limiting his liability to the client for professional malpractice, failing to withdraw fixed funds from his client trust account as required, and failing to maintain a proper account of client funds. In the underlying matter, Anyanwu represented a group of 16 people who had lived in a homeless camp who were seeking damages from the city after being evicted. He agreed to a contingency fee of 25 percent of any recovery. He settled the matter for $4,000 for each member of the group. Anyanwu tendered to one of the group members a letter releasing him from any further claim or liability; she signed it. He deposited the aggregate settlement sum of $52,000 into his client trust account, but failed to withdraw the fixed amount to which he was entitled for more than a year. He also failed to maintain an account journal, client ledgers, or monthly reconciliation for the funds held in trust. In aggravation, Anyanwu committed multiple acts of misconduct. In mitigation, he entered into a pretrial stipulation, had practiced law for 15 years without a record of discipline, submitted evidence from 10 witnesses taken from a range of legal and general backgrounds — all of whom attested to his good character, and also offered evidence of engaging in a substantial amount of community service. Baumbach was suspended from the practice of law for six months and placed on probation for two years after she stipulated to pleading nolo contendere to one count of being an accessory to a felony (Cal. Penal Code Section 32). The offense is a misdemeanor, and the State Bar Review Department determined that the conduct involved moral turpitude as a matter of law. In the underlying matter, Baumbach purchased a pistol at a booth at a gun show. Her husband, who had previously been convicted of a felony, purchased ammunition for it from another vendor. After the required 10-day waiting period, she went to a gun shop to pick up the pistol with her son, who was also a convicted felon, and allowed him to hold it. The pistol and ammunition were later recovered is a search of the residence where all three lived. In mitigation, Baumbach entered into a pretrial stipulation, provide letters from seven individuals taken from a range in the legal and general communities — all of whom attested to her good character, and offered evidence by her clinical psychologist of two traumatic experiences involving gun violence that caused Baumbach to feel unsafe; she no longer owns any weapons and has worked through her emotional issues in counseling. Howell was suspended for 60 days and placed on probation for one year after he stipulated to committing five acts of professional misconduct related to a single client matter. His wrongdoing included: failing to provide legal services with competence, failing to promptly respond to reasonable client inquiries, failing to inform a client of significant case developments, improperly withdrawing from employment, and failing to report a judgment against him for professional negligence to the State Bar as required. Howell represented a client who had filed a complaint against a county and its employees, alleging negligence and medical malpractice. When the client initially contacted him, she informed him of an upcoming hearing on a pending demurrer. However, he failed to appear at the hearing or contact the court or county counsel regarding the demurrer; it was sustained and the county’s motion for summary judgment was granted — along with a subsequent motion for cost and attorney’s fees of more than $68,716, for which the client was personally liable. Howell did not inform the client of the fee award or judgment against her, and ignored the client’s ensuing calls and text messages for more than a year. The client later negotiated with the county to satisfy the attorney fee award for $10,000 — and subsequently sued Howell on several counts, winning an award totaling more than $187,067 in damages. In aggravation, Howell committed multiple acts of wrongdoing that significantly harmed his client. In mitigation, he entered into a pretrial stipulation, presented 10 letters written by attorneys and members of the general community attesting to his good character, and had practiced law for 20 years without a record of discipline. Macklin was suspended from practicing law for two years and placed on probation for three years after she stipulated to failing to complying with numerous conditions imposed in an earlier disciplinary order. She also admitted culpability for three counts of professional misconduct related to a client matter: failing to provide legal services with competence, failing to return unearned advanced fees, and failing to respond to reasonable client inquiries. The disciplinary probation violations included Macklin’s failing to timely contact the Office of Probation for an initial meeting, failing to make required restitution to two clients and to submit proof of that restitution, failing to initiate a fee arbitration with a client or submit the requisite proof of initiating it, failing to timely file a medical information authorization form, failing to obtain psychiatric or psychological treatment at least twice monthly as mandated, and failing to provide proof of compliance with mental health conditions with her quarterly written reports to the Office of Probation. In addition, she failed to filed to file a declaration of compliance for disciplined attorneys (Cal. Rules of Ct., Rule 9.20) as ordered by the California Supreme Court. In the client matter, she accepted an advance fee of $1,000 from a client, agreeing to provide legal help with his divorce proceeding, then failed to return his email messages and phone calls or to provide any substantial services for nearly four years. In aggravation, Macklin committed multiple acts of wrongdoing, caused significant harm to a client, failed to make restitution, and had a prior record of discipline. In mitigation, she sought and has been receiving treatment for mental health issues — and successfully obtained a court modification allowing her to receive treatment from a licensed marriage and family therapist. Maina was suspended from the practice of law for 30 days and placed on probation for one year after he stipulated to committing two acts of professional misconduct related to a single client matter: failing to perform legal services with competence and failing to promptly refund unearned advanced fees. Maina was hired to represent a client with an asylum application for a fee of $7,000, accepting an advanced payment of $4,000. However, he failed to file an essential application that would trigger a biometrics appointment, effectively barring an immigration judge from considering the application. Though he contracted with another attorney to provide legal services to the client on a specific assignment basis, the filing deficiency could not be overcome. The client was ordered removed and his asylum was denied. In aggravation, Maina had a prior record of discipline and compromised a highly vulnerable client: an undocumented immigrant with a facially credible claim for asylum who suffered significant harm in being deported. Nesbitt was suspended from the practice of law for one year and placed on probation for two years after he stipulated to committing acts of professional misconduct as adjudicated in another jurisdiction. The California State Bar Court determined that determination also warranted discipline in this state. In the underlying matter, Nesbitt was made partner at a law firm, and left four years later to join another firm. The misconduct giving rise to the disciplinary charges occurred in two incidents while he was employed at the first firm. In one matter, Nesbitt was serving as monitoring counsel for an insurance company when local counsel sent him and the insurance company a lengthy report detailing the relevant depositions and medical reports in the case. Nebitt made a few very minor changes in the report and sent it back to the insurer, marking the document as “updated;” an insurance adjuster noticed that the similarities of the first and second reports. In addition, he claimed to have reviewed depositions not received until a month after he had left the firm. He then billed more than $5,623 for the alleged work — in addition to $2,001 in fees for attending a deposition by phone, though phone records did not support that claim. In a second matter, Nesbitt billed more than $2,100 for attending two depositions that records showed he neither attended in person nor monitored by phone. In aggravation, Nesbitt committed multiple acts of wrongdoing, misrepresented the truth when questioned about his false billings, and caused significant harm to the law firm’s reputation with the client. In mitigation, he entered into a prefiling stipulation, had practiced law discipline-free for approximately 14 years, submitted letters from 10 individuals attesting to his good character, and testified about pro bono and community volunteer work. Tabor was suspended from practicing law for two years and placed on probation for five years following a contested original proceeding. He was ultimately found culpable of all counts charged related to three separate matters: failing to pay client funds upon request, failing to communicate a settlement offer to the client, failing to respond to reasonable client inquiries, and failing to support state laws, as well as two counts each of failing to perform legal services with competence and failing to maintain client funds in trust. He was also culpable of four counts involving moral turpitude: two counts of making false statements and two of misappropriating client funds. In one matter, Tabor represented four family members in a wrongful death action. In the course of handling the case, he served responses to a discovery request that had not been completed by the client, but prepared and signed by Tabor’s brother, who had earlier resigned from the State Bar with disciplinary charges pending. The client had never seen the substance of those responses or an additional declaration bearing his signature; he had been instructed to merely sign blank forms. Additional improprieties in the representation: Tabor failed to communicate a settlement offer to his clients, failed to appear at a mandatory settlement conference in the case, filed a request to dismiss the case without the clients’ consents — and then failed to inform them their lawsuit had been dismissed. In another matter, Tabor represented a client in a personal injury case — settling it for $6,437. However, a year later, he still had not paid a medical lien from the settlement proceeds — though he falsely assured the client that he had. He eventually paid the lien, nearly eight years after receiving the settlement money. During that time, he allowed the balance in his client trust account to dip to impermissible levels — effectively misappropriating more than $1,150. In the third case, Tabor again mishandled settlement proceeds received, failing to pay a Medi-Cal lien for four and a-half years — misappropriating more than $3,366 for his own purposes. In aggravation, Tabor committed multiple acts of wrongdoing that caused substantial harm to several clients, and demonstrated a lack of insight into the wrongfulness of his misconduct. The State Bar Court judge also allotted aggravating weight to the uncharged but proved misconduct of failing to give the clients written notice that he employed a resigned member of the State Bar. In mitigation, he had practiced law for nearly 40 years without a record of discipline and was given limited mitigation credit both for entering into a partial stipulation of the facts and for evidence of community service that was distant in time and uncorroborated. Waldman was suspended from practicing law for two years and placed on probation for four years after he stipulated to pleading guilty to one count of unlawfully offering to sell a security in an issuer transaction without qualification (Cal. Corp. Code Section 25110). The offense is a felony. After a referral, the State Bar Hearing Department found the facts and circumstances surrounding the offense — involving grossly negligent omissions, concealment, and misrepresentation of facts — also involved moral turpitude. In the underlying matter, Waldman became ensnared in a securities fraud scheme. His involvement began when he took a job as a salesman selling interests in the development of golf course residential communities. He eventually transitioning into working as in-house counsel, though he was not assigned much substantive legal work, and was asked to continue spending at least one-third of his work time cold-calling potential investors. During the time Waldman worked at the company, six investors contributed $812,500. Acting on an informant’s tip, the SEC launched an investigation, and shut down the company after ascertaining it was a boiler room operating as a Ponzi scheme selling unregistered securities. Four of the company’s principals and salespeople were convicted for their roles in the scheme; the president and vice president both pled guilty to 85 counts — including securities fraud, grand theft, and running a fraudulent securities scheme. In aggravation, Waldman caused significant financial harm to several people. In mitigation, he entered into a pretrial stipulation, had practiced law discipline-free for approximately 19 years, and presented evidence of his good character as attested to by numerous individuals taken from a range of the legal and general communities. The State Bar Court judge found the most compelling mitigation in the “extreme emotional, physical, and mental disabilities” Waldman suffered during the time of the misconduct — including a high-conflict divorce, diagnosed major depression, and anxiety and personality disorders. Richards was placed on probation for one year after she stipulated to practicing law in a jurisdiction in which she was not authorized to practice and collecting an illegal fee. Richards was hired by a New Mexico resident for help with a loan modification, accepting $9,444 in fees for the work. Over a two-year period, her office submitted a loan modification package, conducted negotiations and communicated with the mortgage holder on the client’s behalf. When the matter was eventually set for a hearing, she informed the client she could not appear because she was not licensed to practice in New Mexico. In aggravation, she committed multiple acts of wrongdoing and failed to make restitution by returning the fees collected. In mitigation, she entered into a pretrial stipulation, had no record of discipline in 33 years of practicing law, and received limited weight for nine character references, since they were not aware of the full extent of her misconduct. Zimmershead was placed on probation for one year after he stipulated to failing to comply with several conditions imposed in an earlier disciplinary order. Specifically, he failed to submit one timely compliant written quarterly report, another written quarterly report and a final report to the Office of Probation, failed to submit proof of passing the Multistate Professional Responsibility Exam (MPRE), and failed to change his address on the State Bar’s membership records within 10 days of moving as required. In aggravation, Zimmershead committed multiple acts of wrongdoing and had a prior record of discipline: a private reproval with public disclosure. In mitigation, he entered into a pretrial stipulation, demonstrated an attempt to cooperate with the State Bar by promptly registering for the MPRE, and experienced emotional difficulties due to a divorce and related displacement from the family home.